The Ebert–Groener pact, sometimes called the Ebert-Groener deal, was an agreement between the Social Democrat Friedrich Ebert, at the time the President of Germany, and Wilhelm Groener, Quartermaster General of the German Army, on November 10, 1918. Groener assured Ebert of the loyalty of the armed forces. In return, Ebert promised that the government would take prompt action against leftist uprisings, call a national assembly, that military command would remain with the professional officers corps and most importantly the military would retain its traditional "state within the state" status. The agreement gave the government the means to defeat the challenge posed to its authority by those on the political left. However, it also drove a wedge between Ebert's Social Democratic Party and other socialist groups, who accused him of allying himself with the enemy of the revolution. It kept the military, which had been the true power in the German Empire during World War I, as a largely self-governing institution that operated outside of civilian control. Future governments of the Weimar Republic would thus be dependent on the goodwill or lack thereof of its leadership. As US President Woodrow Wilson did not agree immediately to ceasefire negotiations, there was a delay of several weeks. Now, Ludendorff again changed tack and argued in favour of continued fighting and for the exchange of diplomatic notes to be ended. :47–50 However, when he threatened to resign, a successful bluff several times before, this time, on October 26, his resignation was accepted. :51 Ludendorff's successor was Wilhelm Groener. Ebert was one of those three SPD members and was thus at that stage both the head of government and a leader of the revolution. However, he remained concerned that the situation might get out of control and that the democratic system that he was trying to establish might be swept away by a more radical dictatorship, as had happened in Russia in October 1917. As a direct result of the pact, which initially remained secret, the government was not threatened by anti-democratic forces on the right and in the military, at least for the time being. Instead, it was able to focus on the challenges to its authority from the revolutionary left. That led to several armed confrontations, the first of which occurred only a few weeks after the pact. 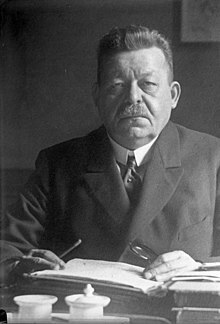 Since Groener saw no point in resuming the fight against the Allies, he advised the government in June 1919 to accept the Treaty of Versailles. Not much later he resigned from the army, as had his superior, Hindenburg on June 29, 1919. Groener is considered the most loyal of the military leaders of the Weimar Republic. His successor, Hans von Seeckt, who, from October 1, 1919, held the new position of chief of the Truppenamt (as the Treaty of Versailles did not allow Germany to have a general staff) was unwilling to follow every order given to him by the civilian government. During the right-wing Kapp Putsch, which involved numerous Freikorps members in 1920, the Reichswehr under von Seeckt refused to help the government. Another consequence was that many former supporters of the SPD saw Ebert's cooperation with the military, which was essentially the same institution as under the Emperor, as a betrayal and turned to the USPD or KPD. That contributed to the eventual erosion of support for the Weimar Coalition and the resulting political polarisation between extremists on the left and right. Most importantly, the military's "state within the state" status and its refusal to accept the democratic Weimar Republic led the military under the leadership of General Kurt von Schleicher to undermine democracy in the early 1930s. ^ a b c d e f g h i j k l m n o p q r s t u Haffner, Sebastian (2002). Die deutsche Revolution 1918/19 (German). Kindler. ISBN 3-463-40423-0. ^ "Ebert-Groener Pakt (German)". Deutsches Historisches Museum. Retrieved 22 May 2013. This page is based on the Wikipedia article Ebert–Groener pact; it is used under the Creative Commons Attribution-ShareAlike 3.0 Unported License (CC-BY-SA). You may redistribute it, verbatim or modified, providing that you comply with the terms of the CC-BY-SA.